Overall, in his career, Pujols has 457 home runs. It seems inevitable that he will eventually join the 500-home run club. He has an overall batting average of .326. He also has 2,148 hits and 473 doubles. He has 1,375 RBI and an on-base percentage of 1.026. 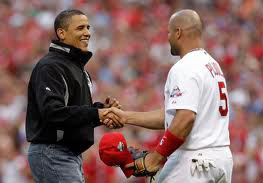 He has also been selected for the All Star game nine times, made appearances in two World Series where he helped make his team the champs in 2006 and 2011. He is a three-time National League MVP, two-time Hank Aaron Award winner, two-time Golden Glove winner and a six-time Silver Slugger Award winner. He first appeared at the Home Run Derby in 2003 and would return to the Derby in 2007. Pujols returned once again in 2009. Now he was in his home field of Busch Stadium in St. Louis. He would make more of a game of this time and make it into the second round. Despite impressive performances here, he has never come away with the Home Run Derby championship. Despite not winning the Home Run Derby championship, Albert Pujols total number of home runs in his appearances stands at an amazing 50, not including the swing offs. That is enough to put him in the top nine home run hitters of all sluggers who have appeared in the Derby. He currently ranks at seven, just above Barry Bonds and below Mark McGwire. In 2003 he has a grand total of 26 Derby home runs, not counting swing off hits. That ties him with sluggers such as Sammy Sosa and Hanley Ramirez. When the 2012 season started, there were many Cardinals fans who took a kind of glee in watching him struggle. For some fans, they held a kind of countdown that ranked the number of days Pujols had played and not hit a home run. Of course, it was only a matter of time before he would return to his form and hit the ball out of the park. Since then, the season has started to turn around and his numbers have risen. Once again, it seems that Albert Pujols has found his stride, and that means the number of records he may yet break remains to be seen.